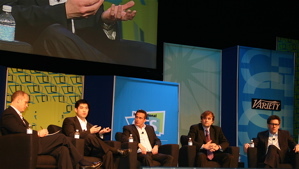 At CES 2008 Monday afternoon, Variety Magazine hosted a panel discussion and Q&A session with representatives from some of today's biggest content providers. Their discussion was the future of content delivery, and the big question was this: How will you make money from it? Featured on the panel were Albert Cheng, executive vice president of digital media for Disney/ABC TV group; Dan Fawcett, President of Fox Entertainment Group's Digital Media arm; newly-inaugurated president of Warner Bros. Digital Distribution Thomas Gewecke; and Tom Lesinski, president of Paramount Pictures Digital Entertainment. The panel was moderated by Variety's president and publisher Charlie Koones. The panelists in today's discussion hold slightly differing opinions on how to monetize their content, yet they all agree upon one point: Apple and iTunes are a positive force in the digital marketplace. When asked if Apple had an unhealthy sway in video distribution, Gewecke, formerly the Sony BMG executive vice president of digital business, was quick to praise Apple. He said they are a great partner to Warner, and that they helped take the download-to-own marketplace from a nascent technology to the position of an important and competitive one. Cheng followed by saying that Apple should be rewarded for creating a great ecosystem that was the first means of effectively distributing content online. He went on to say it is "the best partner we have to legitimize product and make it available." Lesinski of Paramount expounded a bit on the point, rather than offering rank praise to Apple. He said that iTunes is proving to be an excellent place for Paramount to offer catalog films rather than new releases. The best-selling picture from the production company on iTunes, he asserted, is the seven-year old Ben Stiller comedy, Zoolander. Surprisingly, Lesinski said that Paramount is actually garnering higher prices for back catalog releases on iTunes than hard copies of the same film. iTunes seems to be appealing, however, simply because it is an easy solution. When asked about monetization of content and DRM, the answers did not come as quickly. Lesinski said it is favorable to allow for more options in content availability, but "the jury is still out." Gewecke followed by saying it is too early to decide if pay per download is superior to ad-supported content. Fox's Fawcett, however, who didn't offer much of a perspective on Apple, was quite solid on his opinion that ad supported content is the likely victor. He said quite plainly, "people want things for free." Cheng followed by saying that ad support is what drives ABC's content, but the company wants to extract as much value as possible by diversifying. How ads play into the broadband-connected environment is changing, and what advertisement means, he said, needs to be rethought. Toward the end of the discussion, in the audience Q&A segment, the panel was asked: "How are you going to make real money?" The question was fielded by Lesinski, who appeared slightly affronted. He said there is real money in it today, and that every model Paramount has adopted is revenue-positive. Cheng supported this by explaining that the companies know how much they make in broadcast ad revenue, and the same goes for online viewing, their goal is to simply drive it up: maximize the technology and thereby improve user experience and advertising delivery. Another audience member rephrased the question: "When will your online revenue exceed your traditional income?" This, of course, was met with laughter and a lot of "no time soon" type answers. Cheng was hopeful, saying, "Sometime before I retire!"